This study has 5 sessions, incorporating an introductory session and 4 lessons. 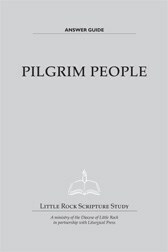 The Study Set includes the Study Guide by Catherine Upchurch and a commentary, Pilgrim People, by Clifford M. Yeary (Liturgical Press). Clifford M. Yeary is the associate director of Little Rock Scripture Study, for which he writes and revises study materials and presents wrap-up lectures. He holds a master's in pastoral studies and a BA in Old Testament literature. He is also associate editor of A Year of Sundays and has contributed to The Bible Today, both published by Liturgical Press. God's people have always been sojourners, pilgrims on a journey, open to God's call and direction. This study explores the major events and characters of the Bible that exemplify God's call to be pilgrims who are 'looking forward to the city with foundations, whose architect and maker is God' (Heb 11:10). Among the biblical pilgrims and sojourners encountered in the study are Abraham and Sarah, Moses and the people of the Exodus, the Jews of the Babylonian exile, the Holy Family and Christ's first disciples. The commentary is written with full citations of the appropriate biblical texts and provides insight into the biblical characters, historical settings and modern applications.